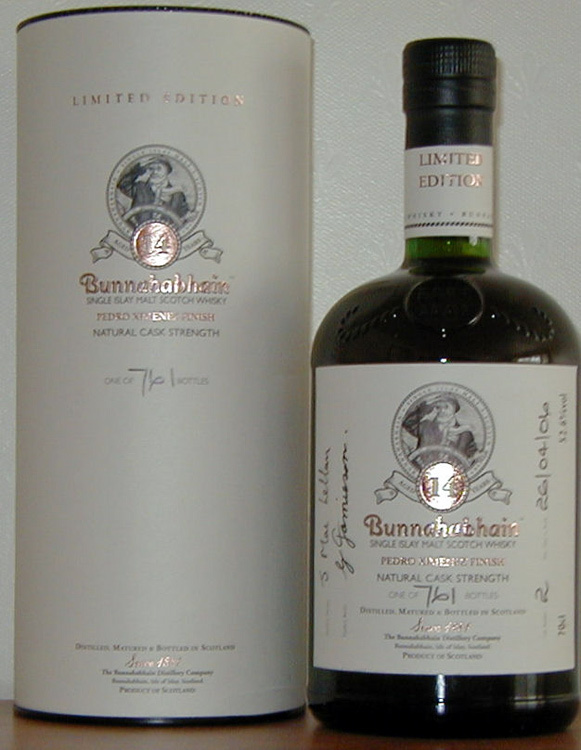 Bunnahabhain always seems to bottle something special for the Islay Festival of Malt and Music and this one , bottled for the 2006 Feis Ile , is no exception . Finished for over 2 years in ex-Pedro Ximenez casks this was bottled on the 26th April 2006 at 52.6% abv and produced 761 bottles . It has a lovely deep amber hue in the glass , the nose is very Cherry Liqueur at first , then dark chocolate , cocoa and creamy fudge . You can definitely tell it’s from a sweet sherry cask . it is exceptionally dry on the palate , chocolate , glace cherries and a touch of confectioners sugar , it has a very long and sweet finish , almost ripe bananas at the end . A very unusual Bunna , nicely balanced in that the PX isn’t overpowering , at least not as overpowering as some PX finishes i’ve encountered . This entry was posted in Islay Whisky Classics by Gordon_H. Bookmark the permalink.